Picture this. It’s December 16th. You’re a working mother of two with her hands beyond full - in the rush to finish off things at work before the Christmas holidays, you haven’t had a chance to buy gifts for your two kids or your partner. Within minutes of opening the email, you’ve completed your Christmas shopping, all without having to venture down the rabbit hole of online browsing. This is a great result for you, and it’s a great result for the department store. This scenario is a company’s ideal marketing outcome - very little resource goes in, and very significant reward comes out. With today’s technology, these personalised messages (complete with *insert name* and all) are becoming ever more popular and ever more expected by customers. Companies across the globe therefore want to have the functionality to send tailored messages to their customers in the hopes that it will bring in more business. That ability to personalise at scale will be useless, however, if the organisation hasn’t prepared its infrastructure for marketing automation. Even worse if on top of that the organisation is biting off more than it can chew rather than taking a phased approach to marketing automation. 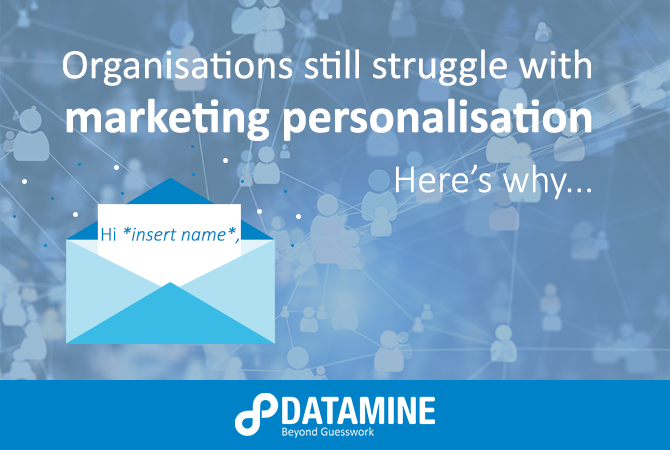 In consulting with Datamine clients, I’ve seen many issues that have contributed to a struggle with personalisation, but the challenge almost always originates from one of the following problems. In order to successfully personalise at scale, your customer data needs to have been cleaned, organised and analysed - it’s a no brainer, yet most companies don’t do the ground work required to truly leverage the platform they want to implement. However, delivering best in class personalisation requires significantly more data work than just cleaning and organising before any true value can be realised. This relates specifically to the creation of a single customer view, giving you the analytical framework to drive personalisation through customer profiling and segmentation. Without this foundation in place, it will be an arduous process to produce effective targeting - not to mention you won’t have the data-driven customer insights you need to deliver them the perfect personalised message. Companies these days all profess to be ‘customer-centric’, but few truly have the customer at the core. A philosophical shift needs to occur within an organisation for it to truly become customer-centric and thereby be able to successfully deliver personalised marketing campaigns. It might seem daunting, but in reality, that shift is what will hopefully bring your organisation the success it desires. One of the biggest changes has to do with inter-departmental alignment. Take the marketing and risk departments in an insurance company as a classic example - marketing’s job is to gain and retain customers, and risk’s job is to, well, minimise and mitigate risk. Marketing wants to release ads encouraging people to claim (because that’s been known to reduce churn), but risk disagrees and says that could cost the business too much money. We see similar struggles across a number of industries between marketing and risk, marketing and sales or marketing and legal - this lack of alignment makes it quite difficult for marketing to actually deliver on their personalisation objectives/projects. And it also means that the focus continues to move away from the customer, dimming the effect of those messages. A great example of a company that has successfully made the transition to being customer-centric is Air New Zealand. With the customer insight-focused guidance and transformation of a number of leaders over the last 15 years, the organisation has been able to completely redirect its centre of attention and emphasise customer experience above all. In doing so, it went from near bankruptcy to being one of New Zealand’s most notable and successful businesses. Air New Zealand is now well-known for its personalised and targeted marketing campaigns - much of which can be attributed to the internal alignment on customer-focused marketing. It’s an age-old issue that plagues businesses, and not just with regards to marketing personalisation. It’s tempting to pour time and resource into some platform in the hopes that it will be a gamechanger for your business, while unintentionally neglecting the people and the process that will be able to actually set that platform in motion. Marketing automation technologies are only a delivery mechanism - you need to invest just as much time (if not more) into the people and processes that create those personalised messages to be delivered. Sure - when an organisation first onboards a marketing automation platform, there’s a great deal of momentum and excitement that can seem like it will carry all the way through the project. However, automation platforms are complicated, and the cutting-edge features that initially seemed so enticing can end up being roadblocks, causing momentum to peter out. Marketers start fixating on what they can’t do with the platform rather than focusing on what they can do. 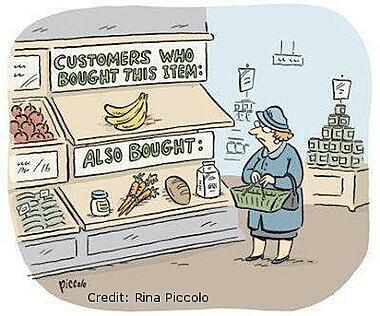 When people and process are valued equally to platform (e.g. more focus is put on training marketers in automation, having the data processes and infrastructure in place etc.) it’s easier to maintain momentum throughout the struggles of onboarding a marketing automation platform. And that’s because a marketing automation platform is useless without the people and process driving it. How can I improve my business’ marketing personalisation? Having a genuine understanding of your customer will create a dynamic environment where you can try new things, fail and start again without worrying about wasting time or resource. And yes - creating the infrastructure necessary to delivering well-timed, well-targeted personalised messages is a challenge, but it’s not impossible. Most of the above issues occur in a complete outsource situation, where a company brings in a third-party to ‘handle everything’ and drive the marketing automation platform - this might seem like the easy solution at first, but it can quickly become fraught with problems (like a lack of customer insight, alignment and people/process focus). Datamine takes a different approach. We believe it’s in an organisation’s best interest to build internal analytics and marketing capabilities, so our service ensures they keep all of the real power in-house. Datamine’s hybrid models allows our team and a client’s team to work on the same marketing automation platform simultaneously, meaning we can support and teach them without taking away their agency. In essence, we provide the infrastructure and transparency organisations need to address the three challenges listed – it’s a phased build of capability designed to drive internal development. There is a lot more to delivering personalisation at scale than a nifty marketing automation platform, and doing so successfully requires a shift in business focus towards data, customers, and people/process. To schedule a chat about marketing personalisation in your organisation with one of our consultants, click here.